A short documentary about a small, independent service organization assisting Flint, Michigan residents with combating the city's water crisis. “CROSSING WATER – FLINT MICHIGAN -2017” is a short documentary about a small, independent service organization assisting Flint, Michigan residents with combating the city’s water crisis which began in 2014 when the municipal water supply was poisoned with lead. Flint, Michigan, USA, 2017. 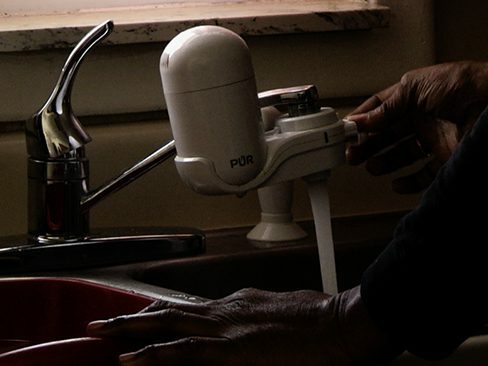 Three years after the city’s water supply was poisoned by lead and deadly bacteria, a local grandmother (Vanessa Terrell) with guardianship of her granddaughter, was told by city officials to remove the contamination, “boil the water.” Weeks after drinking and bathing in the lead contaminated water, Vanessa and other Flint residents learn that boiling the water would make the lead levels significantly higher. Vanessa finds reliable crisis assistance from “Crossing Water”, a small independent social service organization helping Flint’s most in- need get clean water and other vital supplies. Vanessa soon becomes a valued member of the Crossing Water team, assisting her community and educating the social workers who assist her about the day to day realities of living in a poverty stricken city with a poisoned municipal water system. As the social working volunteers deploy into the field as members of Crossing Water’s Rapid Response Teams, they witness, first hand, the economic blight in Flint and the human suffering it has caused. In typical social work agencies, social workers are left alone to process the suffering they see, and ultimately assimilate into their psyches. Crossing Water co-founders Michael Hood and Laurie Carpenter have created a different kind of social work agency that offers its social workers a collective space to unpack the experiences they absorbed in the field so that they may continue on with their social work practice.